Italian cookery can be confusing. As we’ve talked about before, it’s highly regional and even local, so much so that some people say that there is no such thing as Italian cuisine. I don’t agree, but it is true that there are amazing differences between regions, especially as you travel from north to south. And that variety includes many contradictions, especially in the names given to food. And so it is with other foods. A case in point is caponata. When most people hear that word, they think of Sicilian caponata, one of the best known dishes in the entire Italian repertoire. But the Neapolitans also have their own caponata napoletana, and it’s actually nothing like its Sicilian namesake—but actually a kind of bread-based salad closer to bruschetta or panzanella. Caponata napoletana is an incredibly simple dish, but it does call for an unusual ingredient, a kind of twice baked doughnut-shaped bread that looks a lot like a toasted bagel called friselle or freselle (see Notes). 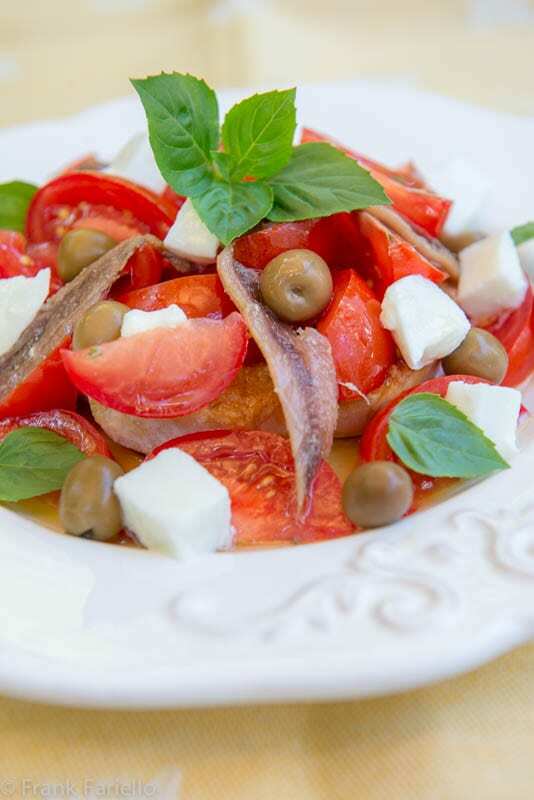 Each frisella is soaked briefly to soften it a bit, then topped with tomato salad and, if you’re in the mood, other savories like olives, anchovies, mozzarella and crumbled tunafish. Caponata napoletana makes for a great antipasto or—if you add lots of those extra toppings—a light summer supper. It’s especially welcome on those days when it’s too hot to even think about lighting the stove. Or when you just don’t feel like cooking. About a half hour before you’re ready to eat, take your friselle, dip them briefly in tepid water and place them on individual plates. Pour some olive oil over each frisella. Now prepare a tomato salad with the tomatoes, olive oil, oregano, salt and pepper, and spoon some of the salad onto each plate, covering the top of the frisella. Now you can add whatever other toppings strike your fancy. Let rest until you’re ready to eat. Just before serving, drizzle a bit more olive oil over each plate. The typical base for making caponata napoletana are friselle, also called freselle, a kind of ring-shaped bread that are partially baked, then split in two horizontally to continue baking until golden brown all over. This two-step baking process removes any trace of moisture from their crumb, so they last indefinitely. The history of friselle goes back a long time, at least to the Middle Ages. They were originally meant for soldiers, pilgrims, fisherfolk and others who would be away from home for extended periods. The dry bread would be reconstituted as needed with water, a bit like hardtack for sailors. (But don’t worry, unlike hardtack, they’re relatively crisp and light.) Their doughnut/bagel-like shape allowed them to be strung together through the middle hole for easy storage and transportation. Besides Campania, friselle are made in most of southern Italy, in particular in Puglia—which is actually where they originated—as well as Calabria, where they are called frese. Sadly, friselle can be hard to find these days. Even my local Italian deli no longer carries them—the manager explained to me that they just aren’t in demand any more. If you live in an area with a sizable Italian-American community, you may have better luck. If not, they can be purchased online. Or you can make them yourself—and they’re actually pretty easy to make, as explained in this post by fellow food blogger Vincent Scordo. Otherwise, you can make a perfectly acceptable caponata napoletana by substituting other kinds of bread—day old bread that you bake in the oven until brown, for example, should work well. I’ve seen Italian recipes calling for those slices of pre-made toasted bread that Italians call ‘fette biscottate‘. And although they’re very different in texture, you might even try making caponata napoletana with an actual toasted bagel. As for any dish as simple as caponata napoletana—and especially using uncooked ingredients—quality is crucial, especially the tomatoes. The dish is at its best this time of year, when the markets are full of tomatoes that are ripe and luscious and full of flavor. The olive oil should be very fruity in the southern Italian style, the best you can afford. And the quality of the optional ingredients—mozzarella, anchovies, olives, tuna—all make a difference, too, if you’re using them. The mozzarella need not be di bufala but it should be fresh. It’s best to let the cut mozzarella drain for a few minutes before using it. This avoids their milk running into the rest of the dish. Salted anchovies will taste better than those in olive oil, and those in jars are generally better than canned. The loose olives you can buy at better supermarkets are almost always better than the kind you buy in jars. And best-quality tuna from Portugal or Italy, while expensive, is well worth it when served like this. About a half hour before you're ready to eat, take your friselle, dip them briefly in tepid water and place them on individual plates. Pour some olive oil over each frisella. Now you can add whatever other toppings strike your fancy. Let rest until you're ready to eat. Wow. This is so close to Dakos, a salad they used to serve in Crete that’s now popular all over the country. A double baked rye bread (rusk) is topped with tomato (chopped or grated usually though), olive oil, goat cheese or fera and sometimes olives, onions, capers etc. Thank you SO MUCH for posting this Frank! I have made those little breads – not too difficult and I am not known as a bread-baker! I am liking this “fishy” version. Good reminder to return to this. Deliziosissima insalata! Funny that even though it’s Neapolitan it reminds me of a holiday on the island of Salina where I have been served the most delicious friselle of my life. In the province of Messina people used to bake chunks of durum wheat bread in a woodfire oven until dry like biscotti and they used them instead of friselle. Ah, the memories! Wonderful memories… they sound delicious! Wow, this is SO different from my family’s Sicilian caponata! I remember when I posted the recipe, I did some research and found many different caponata recipes from different regions. Fascinating how many there are. Yours – as ever – looks amazing. Thanks, Frank, for this intro! I was curious to check out your caponata recipe on your blog. Actually doesn’t look too different from the Sicilian caponata I make. Main difference seems to be the addition of mushrooms. But yes, this caponata from Campania really is a totally different dish that goes by the same name. So very typical of Italian cookery! I just learned about friselle on Snapchat a couple of weeks ago (I follow Elizabeth Minchilli). Funny how there are so many things I still have never heard of! This caponata is my cup of tea and since I’ve not even had breakfast, is making me even more hungry now! Italian cookery really is a source of endless discovery isn’t it? Ci vuole una vita, as they say, to learn it all. And this is why I look forward to you posts, always authentic & informative. You are providing a true Italian Culinary education to all of your readers and for this I thank you Frank. I didn’t know about friselle — thanks for the lesson! And what a neat dish — perfect for peak tomato season. Thanks for the intro! You’re welcome, John! Definitely worth a try, especially this time of year. Può essere servito sia come contorno sia come antipasto. Con i suoi toni agrodolci la caponata racchiude in sé il sapore autentico della Sicilia. It looks so yummy, something to try! I love light dishes! Me too, Paola… Thanks so much for stopping by! I never knew about this kind of caponata, having always made the Sicilian version. But unwittingly, I think I’ve made a similar version of this too. Decades ago, when I was first married, I discovered friselle, and we regularly used them with fresh tomatoes. I must pick some up next time I see them. I guess that shows tomatoes and friselle are a natural combination! Thanks for stopping by, Linda. A wonderful post pointing out regional differences as well as similarities. I haven’t seen friselle in Northern California, but always bring some home when traveling to the Northeast. Another terrific recipe to use my summer tomatoes. Ricordo i pacchi di friselle che portavo a casa da Salerno quando andavamo a visitare zia Elvira, la zia di mio papà, faceva anche lei questo piatto! Quando arrivavamo noi dal nord lo veniva a sapere tutta la via,ritornavamo a Trieste ingrassati e con la macchina stracolma di prelibatezze , che bei ricordi mi hai fatto venire in mente Frank , un abbraccio ! I am certainly happy I came across your blog. My blog could have been named Memorie di Antonia. Names of dishes and pasta can be confusing to a non-Italian. I think it’s because we are proud of our regions and want to give our own names to things. 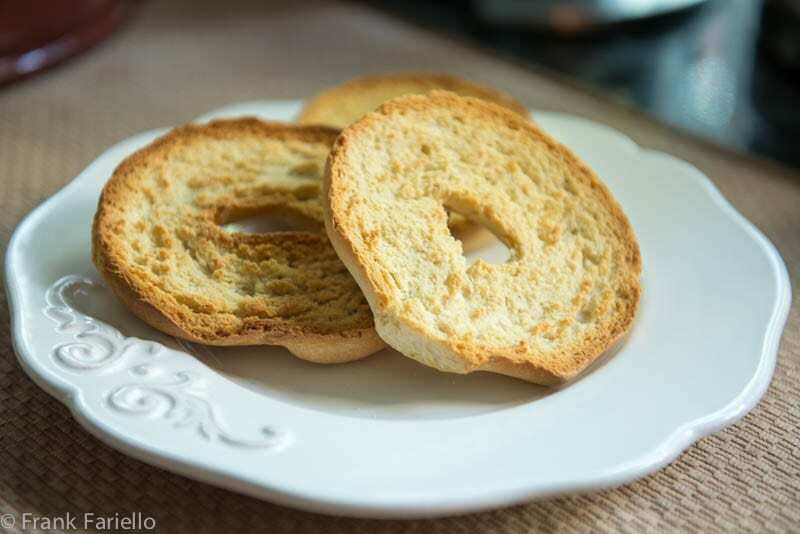 I love to bake so it will be a challenge to make the friselle — I make bagels all the time. Thank you for the memories and the grazie per la ricetta. Buona giornata. I am going to try this today sounds like a perfect lunch to me! I am just going to omit the onion and add roasted peppers!